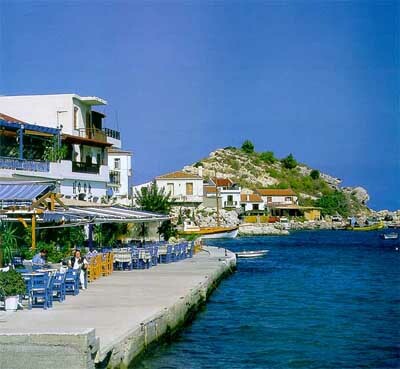 Samos Island, Northern Aegean Islands, Hotels, Restaurants, Shopping in Greece. Of all the Islands in the north east Aegean, Samos is the most popular and it is not difficult to see why. Carpeted with thick pine forests and wild flowers, many see Samos as a Greek "Kent," the "garden of Greece." Situated only 2 miles from the Turkish mainland, this rugged and mountainous island has many beaches, burbling brooks by old villages, picture-postcard seaside villages and ports and access to some of the most imposing ancient monuments in the eastern Aegean. You will find Greek Sun's accommodation in four completely different areas of Samos, each with its own character and ambience. On the north coast we offer holidays in picturesque Kokkari and busy, bustling Samos Town. On the south coast we feature tranquil Votsalakia and cosmopolitan Pythagorion. Sites on Samos: Historic sites on Samos include the Temple of Hera, the second largest temple ever built in Greece and the extraordinary Elplinion tunnel built by the chief engineer of ruler Polycrates beginning in 524 BC. The tunnel over 900 m long was used to bring water to the city of Pythagorio from the mountain springs. Some parts of the tunnel are open to visitors. There is also a renowned Archaeology Museum in Samos with a fine collection of artifacts and art objects. Other sites include both Greek and Roman ruins, a Byzantine monastery and old rustic villages.